Some state elected officials regularly express angst about the growth in city property taxes, blaming local elected officials for this trend. However, this is a case of misplaced attribution. True, city property taxes have increased since 2000. However, the primary culprit behind property tax hikes are reductions in other city revenues—most notably, state aid. Even after adjusting for inflation and population growth, city property taxes grew significantly from 2000 to 2010. In 2000, statewide city property taxes were $346 per capita. Over the next ten years, property taxes increased steadily, reaching $468 per capita by 2010—35% greater than in 2000. Since 2010, city property tax levels have fluctuated upward and downward, ultimately returning to $468 per capita in 2016—the same level they were at in 2010. As property taxes were steadily rising, real per capita state aid to cities was falling.† While total state aid to cities grew from $370 per capita in 2000 to $407 in 2002 as a result of aid increases enacted as part of a 2001 property tax overhaul, over the next eight years state aid fell dramatically, dropping to $212 per capita in 2010. Aid continued to ebb downward over the next three years, ultimately falling to $194 in 2013. Thanks to significant increases enacted in 2013, real per capita aid levels climbed in 2014 and 2015, before dipping in 2016. Total 2016 state aid to cities was $222—40% less than in 2000. When aid levels plummet, local governments must make up for the loss of revenue from other sources. The single largest and most accessible source of replacement revenue is property taxes. Since 2000, 87% of the increase in real per capita property taxes can be explained in terms of reductions in real per capita state aid. However, the significant increase in property taxes was not enough to entirely offset the even larger decline in real per capita state aid from 2000 to 2016. The narrative that city property tax increases are the result of profligate city spending ignores the fact that real per capita city expenditures dropped significantly from 2000 to 2016. A more plausible culprit for city property tax increases is the dramatic decline in state aid to cities. This fiscal strategy championed by conservatives shifted a larger share of the cost of public services on to local property taxpayers. 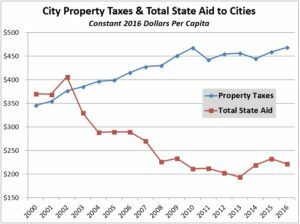 It is certainly true that state aid increases since 2013 have not led to a reduction in city property taxes; with the exception of a one-time drop in 2014, real per capita city property taxes have inched upward from 2013 to 2016. However, real per capita city spending fell dramatically from 2000 to 2013, as shown in the previous article; this is especially true for capital expenditures on infrastructure. City aid and property tax increases since 2013 have fueled only a partial restoration of pre-2013 cuts to real per capita infrastructure investments and other city expenditures. As a result, total 2016 real per capita city spending is still dramatically below the 2000 level. Given the fact that the state economy struggled through two recessions since 2000, some reductions in state aid were inevitable. However, the 40% cut in real per capita state aid to cities from 2000 to 2016 far exceeded the 1.4% real per capita decline in state general fund revenue. As a result, city budgets and local property taxpayers bore a disproportionate share of the fiscal fallout from the drop in state revenues. Cuts in state aid to cities—not city spending hikes—are the major culprit behind real per capita city property tax increases. *The OSA adjusts city revenues and expenditures (including property taxes and state aid) for inflation using the Implicit Price Deflator for State and Local Government Purchases, which is the appropriate index to use when adjusting the finances of cities for the impact of inflation. The most current year for which audited OSA city data is available is 2016. †The largest category of state aid to cities is Local Government Aid (LGA); in addition to LGA, total state aid to cities as defined by the OSA includes other property tax aids and credits, pension aid, highway aid, and various other aid programs. LGA increased from 2000 to 2002, but declined dramatically in the subsequent decade. By 2013, real per capita LGA was less than half of its 2002 level. Increases in LGA from 2013 to 2016 were sufficient to restore 22% of the decline in real per capita LGA from 2002 to 2013 and 41% of the decline from 2000 to 2013.